German automobile engineering reaches its apotheosis in brands like Audi, designed to tackle the high speed rigors of the Autobahn with ease. Audi's popular sport sedan, the A4, combines a high performance engine with a range of appealing exterior features for a vehicle that looks as good as it performs. Foglights and headlamps balance in a pleasing geometric configuration around a front grille that proudly displays the Audi brand badge in shiny chrome. Quad exhaust pipes lend both efficiency and unique design to the vehicle's rear bumper. A black optic package is also available offering glossy black side mirror housings and titanium detailing on the hubcaps. 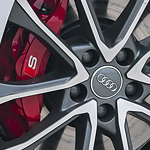 If you would like to take a closer look at the Audi S4, you're invited to visit us at Audi Downtown LA. We've got plenty of options to choose from and can arrange for you to take an A4 out for a test drive or answer any questions you may have.